Mary McLeod Bethune once said: “Faith is the first factor in a life devoted to service. Without it, nothing is possible. With it, nothing is impossible.” Linda Brown Douglas’ life reflects those words. From her strong faith in God to the way she constantly goes out of her way to help others, Douglas demonstrates how harmonious our world could be if we all devoted more of ourselves in service to others. Douglas, who graduated from Carolina in 1982 with a bachelor’s in journalism, returned to her alma mater in November 1998 as director of Community Relations in University Relations. Today Douglas is director of Volunteer Engagement in University Development where she staffs the UNC Board of Visitors and the Alumni Committee on Racial and Ethnic Diversity. Anyone who knows Douglas knows that she is always ready with ideas, lessons learned and important resources. Over the past two decades, she has shared her wisdom – with colleagues, fellow volunteers, college students and parents alike. For all of her volunteer work and giving back to her community, Douglas is perhaps most at home helping students. She does whatever is needed when it is needed. It is not uncommon for her to take students to the train station, deliver a package from home or pass her own neighborhood in Cary to drop off a first-year student in Raleigh for the weekend. 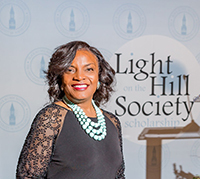 When Douglas began volunteering for scholarship interviews at her former high school in Charlotte, she was encouraged to look after the participants who chose Carolina. As a result, she began taking students to lunch in groups and giving them an opportunity to share best practices with each other. As soon as one student moves on, she is introduced to another mentee. Sometimes, they are students with strong support systems at home. Sometimes they are not. Douglas helps them all. Douglas also shares her time with student organizations. In 2013, after learning that the Kappa Omicron Chapter of Delta Sigma Theta Sorority, Inc. needed an adviser, she agreed to serve. She is now part of a five-member team of what has become one of the most outstanding collegiate chapters in the country; the organization has twice won National Chapter of the Year. In 2017, Douglas was recognized as the UNC Adviser of the Year and the Kappa Omicron advising team was recognized as the 2017 National Advising Team of the Year. And then there is Douglas’ community work off campus. She is second vice chair of the Prevent Blindness North Carolina board and a selection committee member for the Clinton L. Blake Scholarship at West Charlotte High School. She served on the national board and nominating committee of the Association of Junior Leagues International, made history in 2007 by becoming the first African-American to serve as president of the Junior League of Raleigh and served as a co-chair for the 2001 Governor’s Inaugural Ball. She also served on the SafeChild board. Douglas was inducted into the Triangle YWCA Academy of Women and recognized as a Tar Heel of the Week by The News & Observer. She also has had two gubernatorial appointments: the North Carolina Judicial Standards Commission under Governor Mike Easley; and currently the North Carolina Executive Mansion Fund Board of Directors under Governor Roy Cooper ’79 (’82 JD). As director of Volunteer Engagement in University Development, Douglas continues to advance helping others. She developed a program in which members of the Board of Visitors engage with top academic prospective students through targeted telephone calls and personal meetings in their hometowns. On the Back End, another BOV committee Douglas created, facilitates networks between students and BOV members to help students prepare for careers. Douglas believes that every student can benefit from an extra support system; she is happy to be that system, that reference, that cheerleader saying: “No matter how bad you think your situation might be, it’s not over. You CAN succeed.” And that’s what she tells every student she mentors.